What Are The Uber Driver-Partner Requirements for 2018? In order to start driving, you should know Uber’s driver-partner requirements to make sure you are eligible to be approved. In order to make it easier for you, I gathered everything together and created one page for you. Here are Uber’s driver-partner requirements you’ll need to meet in order qualify to drive this year. In a nutshell, these are your basic requirements to become an Uber driver-partner. While these basic requirements are pretty straightforward, let’s get a little more detailed below. For the most part, this requirement is pretty straightforward. I would never recommend buying a car which just barely meets this requirement. For example, if you get say a 2002 manufactured vehicle, the next year you won’t meet the vehicle year requirements because then it will be 2018 and your car will now be 16 years old. It does state this directly on the Uber website, and, as an ace-in-the-hole, my friend tried signing up with his 2 door BMW–it wasn’t approved, even though it’s a $50,000 car. Also, make sure your car can seat 4 passengers (excluding the driver) so there’s enough room to pick up a group of people. The last thing to take note of related to “salvage” vehicles; they are simply not allowed. If you don’t have a vehicle, that’s OK also. 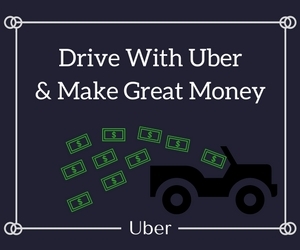 All you need to do is sign up to drive, and, once approved, you can have the option to get a car through Uber’s car financing program. Make sure you check your city to see what your local requirements are. When you decide to become an Uber driver-partner, you may need to have your car inspected. Depending on where you live, you might be able to get a free car inspection by one of Uber’s mechanic locations. Of course, if you would rather have your own personal mechanic do the inspection, that’s fine too. You just need to make sure he is approved by Uber. Do your seat belts work for all the seats? Do you have any headlights or taillights out? Uber requires that your vehicle be inspected every 12 months. Make sure you are keeping your car maintained, even after you pass the first inspection, or you won’t get approved the second time around. One of the main requirements to drive with Uber is providing a valid vehicle registration. Even if your name is not on the registration, you still need to upload the document to Uber. It’s perfectly fine (and legal) to not have your name on the registration and still drive for Uber, providing you have your name on the insurance policy for that car. Most states in the U.S. already require you to have some form of car insurance to legally drive, so this requirement should be pretty simple for you. You just need to make sure your insurance meets the minimum state requirements to drive for Uber. If your driver’s license is not from the same state you plan on driving in, you won’t be able to drive. Of course, if you are living in the state, you should have already changed your license. Also, you need to make sure you have been driving in the U.S. for at least one year. It would be pretty scary riding with Uber if the driver-partner told you they just got their license 2 weeks ago! Even if you have driven internationally for 30 years, if you haven’t driven a full year in the U.S. you won’t get approved! Every state (and every country) has different laws in regards to driving. Obviously, it is best to know the state’s rules before you start so you don’t get pulled over and receive a fat ticket for something you weren’t aware of. If your driver license is not from the same state you plan on driving in, you won’t be able to drive. Of course, if you are living in the state, you should have already changed your license. Also, you need to make sure you have been driving in the U.S. for at least one year. It would be pretty scary getting in an Uber vehicle and the driver told you they just got their license 2 weeks ago! We’ve already talked about the registration a little, but just to add on one more thing, you need to make sure your registration is current and you have in-state license plates. We would never be a big fan of getting in an Uber vehicle in San Francisco, if the license plate read North Dakota. It’s super sketchy, and we would feel the person is picking up rides in the wrong state. Not every person will feel safe getting picked up by someone who has had a DUI or a criminal charge on their record. Have you had a DUI in the last seven years? Have you been caught for reckless driving? Have you been in any car accidents? Have you committed any crimes? If so, what kind of crimes have you committed? If your driving record is clean and you haven’t had any issues with the law, there will be a good chance you pass with flying colors. If you’ve gotten a few speeding tickets or had a minor offense with the law, you can still sign up and give it a shot. The worst that would happen is not getting approved, but you won’t know until you try. If, for some odd reason, you fail but feel as though you should have passed, send Uber an email to find out what disqualified you. Maybe it’s a mistake which can be rectified or something you can fix. What If I Want To Drive With Uber Black? What Are The Uber Black Driver-Partner Requirements? Honestly, if you have never driven with Uber, we would recommend doing UberX first before attempting to move up to Uber Black. It’s a much higher commitment to using a more premium service. If you want to learn more about driving with Uber Black, be sure to check out our Uber Black Car requirements first. Meet The Requirements and Wondering How You Sign Up To Become An Uber Driver Partner? Becoming an Uber driver is pretty straightforward. It only involves a few simple steps. Step 1- Complete the Uber sign up page. Step 2- Get your vehicle inspected at one of Uber’s inspection locations or by an approved 3rd party mechanic. Step 5- Start driving to earn money! The simplest way to see if you are eligible to be an Uber driver-partner is to sign up yourself and see if you pass.